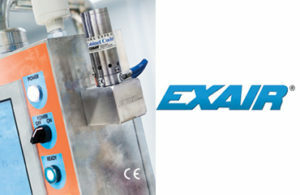 EXAIR’s new Type 316 Side Mount Kits make the mounting of a NEMA 4X Cabinet Cooler possible when an electrical enclosure has limited space on the top or side. These Type 316 Side Mount Kits are corrosion resistant. The compact Cabinet Cooler is a low cost way to purge and cool electrical control panels, protecting sensitive electronics from heat, dirt and moisture. Cabinet Coolers convert an ordinary supply of compressed air to 20 deg. F without refrigerants or CFC’s. The cold air is circulated through the enclosure to eliminate high temperature malfunction. Cooling capacities up to 5,600 Btu/hr. are available. Cabinet Cooler systems include a compressed air filter to assure no moisture or dust is introduced inside the panel. Optional thermostat control minimizes compressed air use. Cabinet Coolers are UL Listed, conform to the CE general safety directive for machinery and have no moving parts to wear out. The Side Mount Kits maintain the NEMA 4X rating of large and small electrical enclosures. Models for use on NEMA 4 and 12 enclosures are also available. Applications include cooling PLCs, microprocessors, variable frequency drives, industrial computers, and robotics. Side Mount Kits start at $220.